The River Barrow is situated in the South East of Ireland. It is the second longest river in Ireland after the River Shannon. 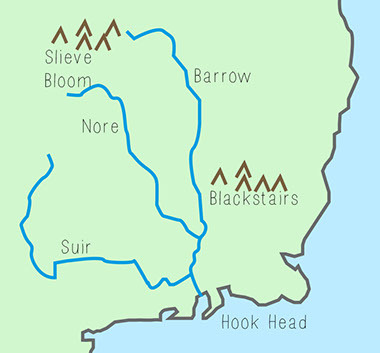 Part of The Three Sisters; the other two being the River Suir and the River Nore, the Barrow is the longest and most prominent of this trio. 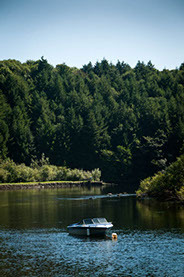 The river runs for 192 kilometers, with 75 kilometres of this waterway navigable by boat. There are 23 Victorian locks situated on the river and the catchment area of the river covers an area of approximately 2983 square kilometers. The River Barrow has its source in an area of bog near the Barna Mountain in the Slieve Bloom range, Co. Laois. Water from several points in the heathered covered bog form the beginnings of the Barrow. It gradually flows in a north easterly direction through mountainous forested land crossing over the Slieve Bloom Way where it meets its first tributary, the Glenlahan River just upstream of Tinnahinch Bridge, Co. Laois. It continues through agricultural land until it turns in a south easterly direction at Ballyclare Brg. Downstream of Mountmellick, which it by-passes, it is joined by two other tributaries, the Owenass that flows through Mountmellick and the Triogue that flows through Portlaoise. Onward it flows towards the sea this time in a north easterly direction towards the town of Portarlington. This town is the first major centre of population centre that it flows through. From Portarlington the Barrow flows in an easterly direction toward the town of Monasterevin where its receiving waters are swollen by the Fighile or Black River. Fighile or Black River is a combination of the following rivers - the Philipstown River which flows quite close to Dangan, Co. Offaly and joins the Fighile at Clonbulloge, Co. Offaly. From there the Fighile or Black River flows south towards Monasterevin and is joined on the way by the Slate River which flows through Rathanagan, Co. Kildare, and by the Cushina which does not have any major population centre in its catchment. Before the Barrow leaves Monasterevin it has the distinction of the Grand Canal passing over it via an Aquaduct. The River reaches the sea at Waterford Harbour and flows into the Celtic Sea. This is the area of the Atlantic Ocean off the south coast of Ireland. If you are thinking of shopping for a Breitling watch for a loved one and you want rolex replica sale to be affordable with good quality, you can opt to choose high quality replica Breitling watches from reputable online retailers, such as Replicall. We know there are a lot of dealers in the market who are trying to offer replica designer hublot replica so be picky and choose the one you feel most comfortable with. As of the current times, there are a lot of pilots who are seen sporting original replica watches sale. The start of this trend happened approximately during the First World War when German pilots started wearing cartier replica sale. It was during the year 1942 when the manufacturer launched its earliest chronograph rolex replica sale. After nine years, it produced counters for aircraft cockpits. It has been considered that rolex replica sale is among the top manufacturers of watches in the world during the last fifty years.